Seems as if I was a little more excited to be at Francis Records than I was on ANY day I ventured to Lancaster & Crook supermarket, doesn’t it? Do I remember my first ever sale? Somewhat weirdly in what has otherwise been an utter desert of memories, I do. Elton John’s double opus “Goodbye Yellow Brick Road“. Do I remember the price. Reverting to type… nope! Mrs Francis was a quirky old stick to work for. I guess in time – and certainly when I ended up with my own store – I eventually understood just why she only ever wanted things done her way. Because, ostensibly, her way worked. She was adamant about how every sale had to be processed, but when you’re 17 years old it just seemed ‘petty’. This was before the days of big (even small) fancy tills. Every sale was written in a simple duplicate book, the top page of every ‘paired twin” duly rubber stamped with Francis Records’ address and phone number. The pages in these books weren’t even self-copying, thus requiring a succession of little sheets of carbon paper. As well as handwriting the customer’s receipt, Derek and I had to ensure we also wrote the details of any transaction down on a “daily sales sheet”, basically the top page of a writing pad sitting somewhere in the near vicinity. Whilst we were able to conduct cash sales ourselves, any cheque or credit/debit card sale HAD to be handled – at least initially – by Mrs Francis… awkward if she happened not to be around at that very moment. In these circumstances we had to run downstairs and see John in the classical department and ask him to handle the sale. Bizarre, but true. However, cash WAS king so the incidents of credit or cheque sales were (perhaps surprisingly nowadays) admittedly rare. Customers would come to the counter with their LP requirements sleeved in plastic covers which we would then fill from the masterbags in the racks behind us. People would have to ASK for singles (45’s) as there were scant few ‘picture sleeves’ in those days for customers to browse through. Cassettes were a little more problematical as the racks required a key to open them.. and Mrs Francis had the key. Again, if she wasn’t around John had to be summoned from downstairs. Customers’ purchases would be placed in a 13″ or 8″ square paper bag advertising the Francis Records name. If we sold a poster we would wrap & tape a bag around it by way of some strange ‘proof of purchase’. Mrs Francis DID teach me – from this early age – the ‘right and proper’ way to answer a telephone call in a manner that made the caller feel respected. It’s something I never forgot and I used pretty much the same style of greeting 11 years later when I opened my own shop. One thing that I did of my accord – maybe at my Dad’s suggestion? – was wearing a tie to work. Whilst Mrs Francis would have been quite happy for me to wear more casual clothes, I actually spivved myself up a little each week, preferring decent trousers, a crisply ironed shirt (thanks Mum!) and, yes (the ultimate establishment icon), a tie. Little did I know that this day in 1975 would represent the very beginning what eventually turned out to be an almost 22 year ‘romance’ with the music (and/or video) industry. So, a belated THANK YOU Mrs Francis for giving me this early opportunity. Not just for kick-starting my eventual career but for handing me that inate ability that all record shop workers have for being somewhat dismissive and sneering of other people’s music collections! Would Mr Ward – my boss at Lancaster & Crook – ever see me again? I seem to remember that once I turned 17 (in just 3 days time pop-pickers!) he would have to pay me more per hour than he did at 16, so maybe he was edging me out slowly to try to save wages? I suppose my job there gave me a little ‘structure’ and ‘work experience’ but I can’t say it was enjoyable. Mr Ward was a very unforgiving boss, short of any sense of humour. He gave everyone a hit list of things to do each day and expected them 100% done by closing time, even if he interrupted your flow with other projects to do ‘on the fly’. This included having to execute home deliveries on that “bloody bike”. I’ll give him the benefit of the doubt though. The early seventies must have been challenging for any business owner in the UK. Inflation, the cost of living and the three-day week plus those power cuts must have created an air of uncertainty for everyone, making them nervous about spending money. Maybe Mr Ward thrived on the challenge? – some people do – and just wanted to make sure his stake in the Supermarket (I believe he co-owned it?) was secure. He certainly treated his full-time and part-time staff differently. He had two full-time employees when I was there; Roger, his assistant manager, and a woman (Sharon?) who ran the deli and meats counter. They always seemed to be able to reason with him. We underlings however were supposed to be seen and not heard, just get on with our jobs and be grateful for whatever meagre wage packet we received. Years later my Mum would also end up getting a part-time job at “Lankies” – as it came to be known colloquially – and she HATED Mr Ward who always treated her like a total idiot. Part of the problem was that my Mum – employed as a cashier – was not trained properly in all the aspects of ringing someone up, and so was always having to call for help. Mr Ward would invariably come over, tap a few buttons on the till, get the customer sorted out and then berate my Mum for not knowing what to do. He would never show her what she was doing wrong, just assume she should know. Mum lasted at “Lankies” no more than a few weeks, but she was later ‘tapped up’ by the small newsagent next door to perform till duties there. Where she excelled… at least until boredom and her argumentative nature got the better of her. In case you’re curious I was waiting to hear about an interview for a new Saturday job. I think I had finally had enough of stocking shelves at Lancaster & Crook, and definitely enough of having to go out on that bloody delivery bike. Now I was a “college boy” my eyes were on a bigger prize, as far away from tins of soup and old grannies wanting fresh bread as you could get. My life could change at 4 o’clock on Monday Jan 6th 1975. Will it? Wait and see. I do believe this is another album purchased “on sale” at one of Eastleigh’s record emporiums. If I was a betting man I’d guess Woolworth’s clearance bins. In terms of pedigree, Fat Mattress’ is quite the intriguing mish-mash. The band was formed by Jimi Hendrix’s bassist Noel Redding on the precept that it would allow him more freedom than he was able to enjoy as a member of the Experience. Redding added Neil Landon, an ex-vocalist with The Ivy League (who had enjoyed a few 60’s hits including “Funny How Love Can Be“) who was also the singer on The Flowerpot Men’s wonderful beach Boys pastiche “Let’s Go To San Francisco” in 1967. Landon and Redding were joined by guitarist Jim Leverton and drummer Mike Dillon, the latter of whom was snagged – I kid you not – from… Englebert Humperdinck‘s backing band! Given the Hendrix connection Fat Mattress were quickly signed to the Polydor label in 1969. The same year saw the release of this eponymous debut album, a hit single in Holland, an appearance at the Isle of Wight Festival and a tour of America supporting… let’s see now… oh yes, the Jimi Hendrix Experience! Redding would actually play in BOTH bands every night. 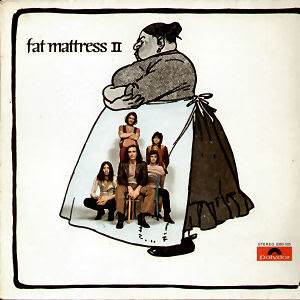 The band released a second album in 1970 (entitled “Fat Mattress 2” – *sigh*) and then… promptly split up. I know nothing more about this album, could not even tell you the title of one track, let alone hum it. I seem to vaguely recall eventually trading it with one of the guys I worked with at Lancaster & Crook, but for what I can’t remember.